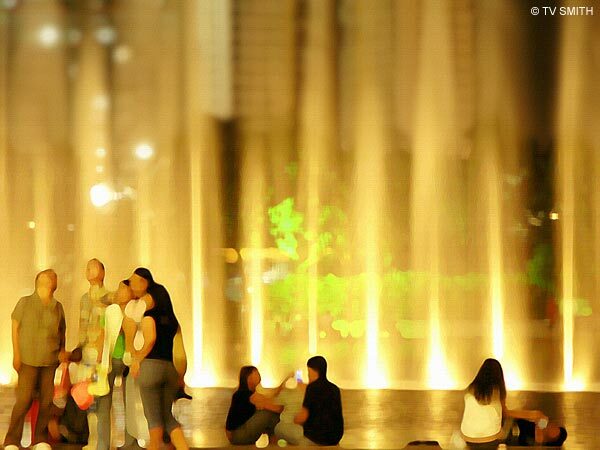 A hazy evening with lovers and tourists posing in front of a curtain of water at KLCC. A painting opportunity. This requires a paint program in addition. By applying the Paint Daubs filter with a dash of Canvas Texture, I created another 'painting' to hang on the wall. Since the light level was relatively low, I waited for the three sets of people to freeze in front of their own cameras before clicking. This allowed the use of a fairly slow shutter speed without the associated blurring of movement as seen in the background fountain jets.